With so many games to choose from at Too Many Games, how does an indie developer stand out? How about offering you the chance to blast away dinner entrees as a fleet of dessert space fighters? 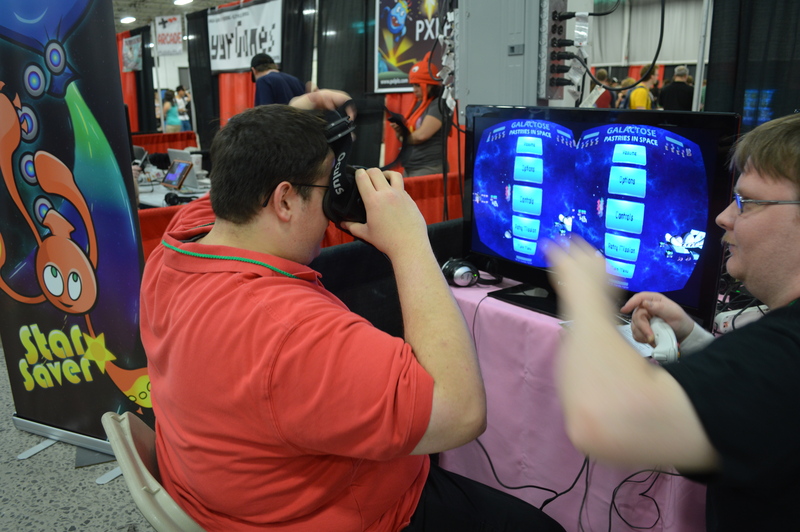 That’s exactly what Team Galactose had on display this weekend and that’s why Galactose: Pastries in Space was the first game we got our hands on. Galactose: Pastries in Space is a 3rd person flight combat game that tasks you with a seemingly simple objective: destroy the dinner entree forces. I say seemingly simple because once I actually stepped up to the controls, I was blown away by the sheer scope and scale of the battle. Flying my trusty cupcake fighter, I speed off toward the battle only to realize that there were hundreds of ships already locked in heated dogfights around the massive turkey dinner mothership. Here is where the game really shines. The developer is aiming to give players the experience of a massive space battle similar to what you would see in Star Wars. From what I sampled, it seems to be working so far. There was so much action on screen that it was sometimes difficult to grasp what was happening around you, but this also contributed to the overall spectacle of the game, and it made the usually empty setting of space feel alive and brimming with motion. As I skirted the outside of the battle, the comically bright and cheery backdrop of donut planets and food shaped spaceships kept me laughing even as I struggled with the controls and the lack of a horizon to judge orientation (it is in space so there really isn’t an “up” or “down”). The colorful and funny art style immediately draws you in to the whimsical world and fits perfectly with the overall tone and themes of the game. After I got the controls down, I was off to the frontline…where I was promptly shot down. Luckily, the developers have implemented a fun and forgiving system in which you teleport to a different ship after you’ve died, a feature I made good use of while playing. I appreciated this mechanic because it offers the players an opportunity to experiment and play recklessly without fear of losing the game. This isn’t to say there isn’t a challenge, but this accessibility is a nice touch for those that simply want to have fun with a game. With a sheepish grin due to my shaky start with the controls, I dove back into the thick of battle. I banked and rolled, firing laser blasts at any hamburger ship that crossed my path. I swooped between huge garlic cannons near the turkey dinner mothership and dodged its massive protruding drumsticks. I may have looked serious playing the game because I was so intently focused on the enormous and hectic battle raging in front of me, but on the inside I was smiling the whole time. The ship movement felt solid and appropriately “spacey” with a sense of speed mixed with some weightlessness and fluidity. I did notice some instances of hit detection issues where I fly through a garlic turret or two, but that is to be expected of an early build of the game. Even so, maneuvering struck a nice balance of fun and challenge. Finally, after numerous deaths, plenty of kills, and tons of explosions, the turkey mothership was destroyed, but my playing time didn’t end there. 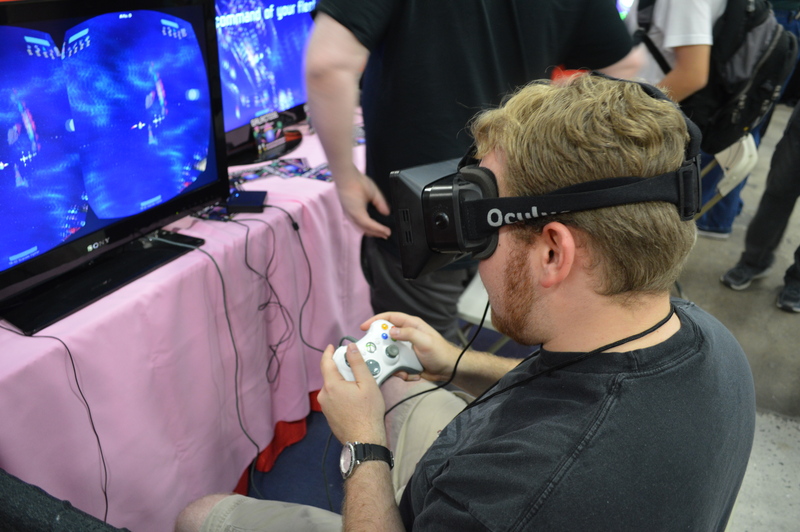 Galactose: Pastries in Space also offers the ability to play with the VR headset Occulus Rift. Luckily, after my first play test, I was able to try out the game in virtual reality, making Galactose my first Occulus Rift experience. Turning your head to look around your ship and fire in that direction is a fun idea, however, I found the Occulus Rift made aiming more difficult as the resolution was lower on the headset and the reticle didn’t seem to track with the head. Gamers might want to stick with the precision of a physical controller or keyboard and mouse for aiming, however, the Occulus Rift does offer another fun way to experience the massive food fights in space. As VR technology evolves and the game comes closer to completion, I expect the experience will become easier to use and a practical method of controlling the game. After completing my gameplay sessions, I had the opportunity to chat with one of the developers about the game and find out a little more about their project. You can check out the full interview in the video below. Relieved after a hard won battle, and excited after a nice chat with the developers of Team Galactose and an Occulus Rift demo, I left wondering what other fun battles and encounter Galactose: Pastries in Space has in store for players. If you want to find out more, visit the developer’s blog right here, and make sure to vote for the game on Steam Greenlight here. And I’m glad your love of food influenced the game’s look, because that’s what drew us to the booth in the first place. Hopefully we’ll hear more from Team Galactose in the future!